I love potato skins, i know they’re tacky and awful and the kind of food that we associate with TGI Fridays and other such American chains but i don’t care. I also know that i probably should have grown out of such things long ago but this love seems to be an enduring one so I’ve decided i might as well just embrace it. I think part of the reason they’re so maligned is that, more often than not, they come out soggy and so greasy that you could fry and egg on what’s left on your plate. This is what i set out to change. If you think about it, they should be healthy, they’re the skin of a potato, and wasn’t that what your mum always told you to eat because it had all the goodness in it? What makes them so unhealthy usually is the fact that they’re deep-fried which is just totally unnecessary, all they need is a mere lick of oil and a very hot oven and they come out deliciously crispy and salty and (dangerously) moreish. 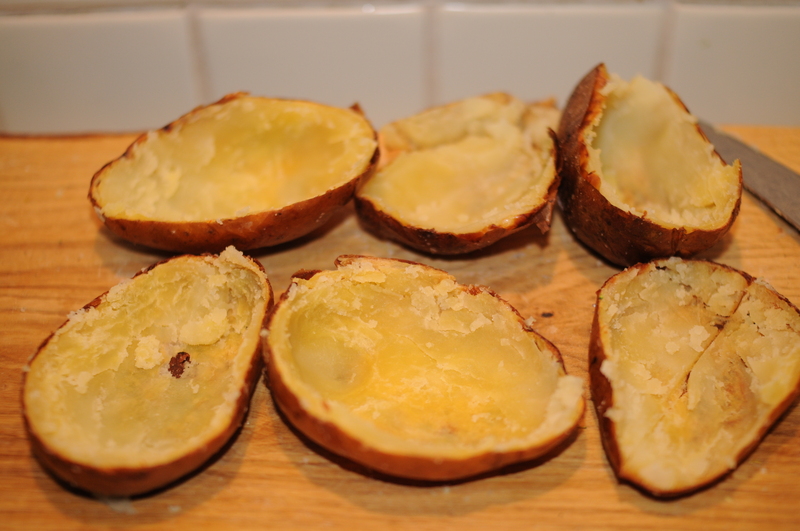 They’re also remarkably hassle free, simply bake them as you would a normal jacked potato, then scoop out the middle, cut into wedges and pop back in the oven and hey presto; perfect, healthy potato skins. They might take a while in the oven but the hands on time is minimal. Also, by making these yourself it means that you really stretch these potatoes, save the middle and you have instant mash. The toppings are endless for these: sour cream and chive, garlic mayo, sweet chilli, guacamole, baba ganoush, cheese-bacon-spring onion. You could dip them in chilli con carne, soups, stews. Make them with sweet potatoes instead, whatever you like. I told you that was all there was to it. 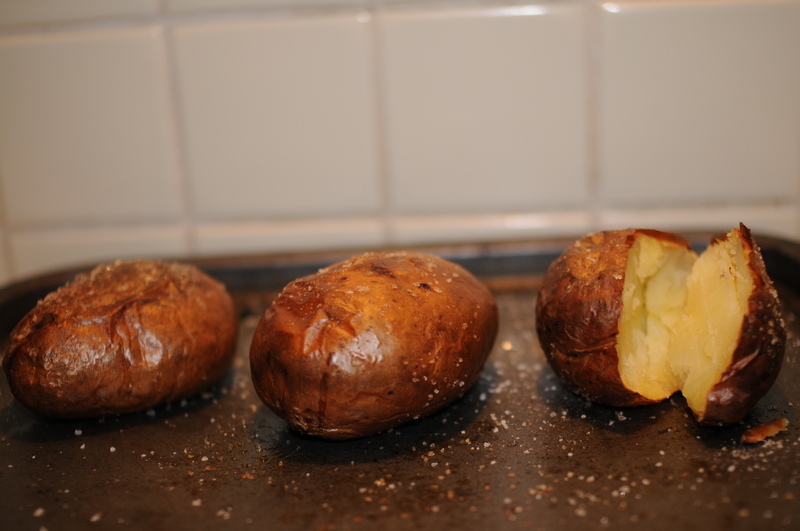 Now, pre-heat your oven as high as it will go, coat the potatoes in a little oil and sprinkle with salt. You only need a little oil and if you’re concerned about salt intake then you can leave it off entirely. Personally I’m hoping it’s not something i have to worry about too much yet so on it went. 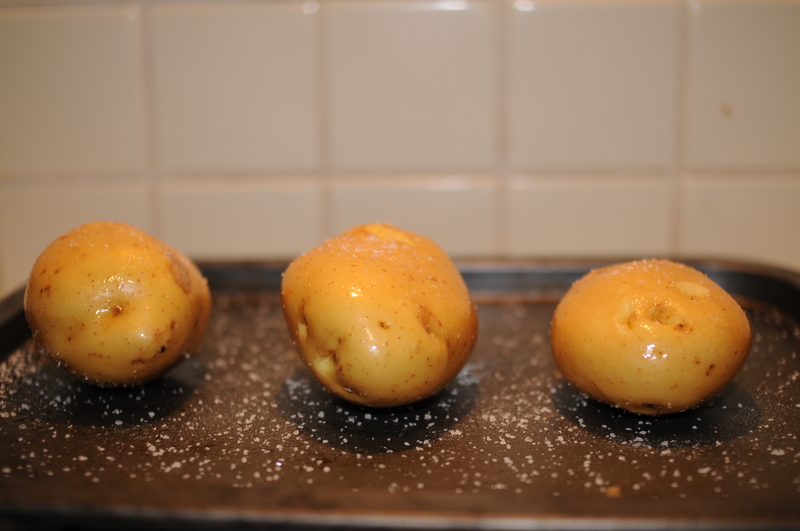 Pop them on a baking tray and cook until the outside is crispy. If the skins are crisp but the middles aren’t quite cooked, turn the heat down to about 170C until they’re cooked through. Remove from the oven and put the temperature back up to full whack, cut them in half and scoop out the flesh, leaving a cm or 2. Drizzle the insides with a little more oil- if you have an oil spray, even better. Put back in the oven until the insides have dried out and everything has crisped up. Now you’re ready to dip to your heart’s content. 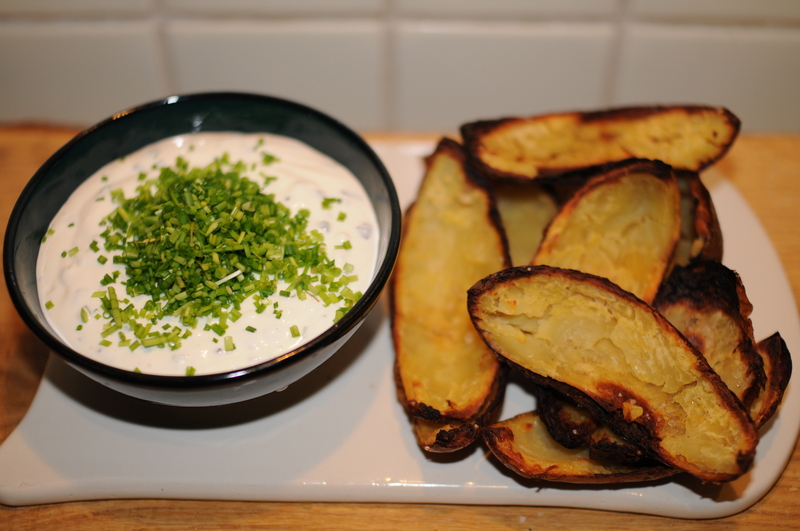 I went for sour cream and chive as it was in the fridge and just heaped on some more fresh chives for extra flavour. Love this, any ideas for the potato that you scraped out? there are lots of things you can do with it, mash is the obvious choice but there’s also potato cakes, bubble and squeak, use it to top shepherds pie, make it into croquettes or soup, bread or even a souffle! 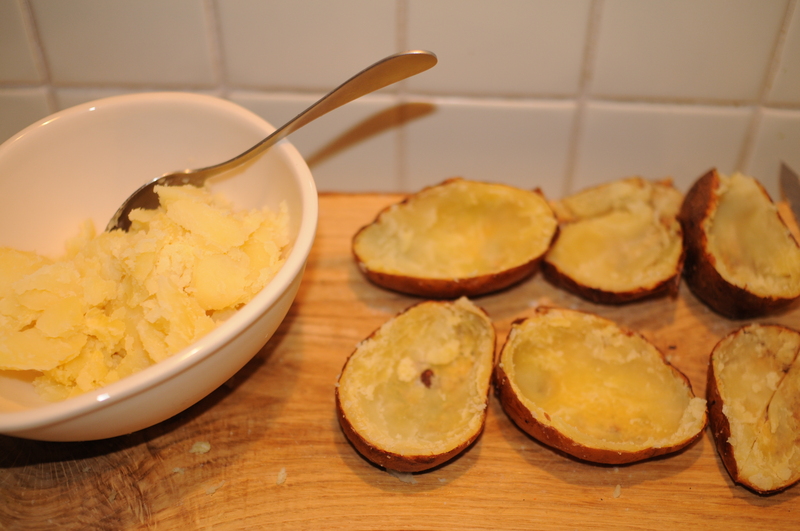 I have also found they work almost just as well if you cook the potato in the microwave, then follow the cutting and cooking in the oven, saves time it you are late in from work but fancy something easy and tasty.